What would you do if the one you loved was not actually the one you loved? What would you do if your best friend was in love with the one you love? What would you do if your best friends are sacrificing their love for you? Meet Raj (Hrithik Roshan), Pooja (Rani Mukerji) & Tina (Kareena Kapoor) - 3 best friends thrown into situations that time, letters, love and separation have created for them! Friendship…the beginning of every relationship ends in love…and love…well it can have only 2 ends. A happy or a sad one…or can there be a third ending for these 3 friends? 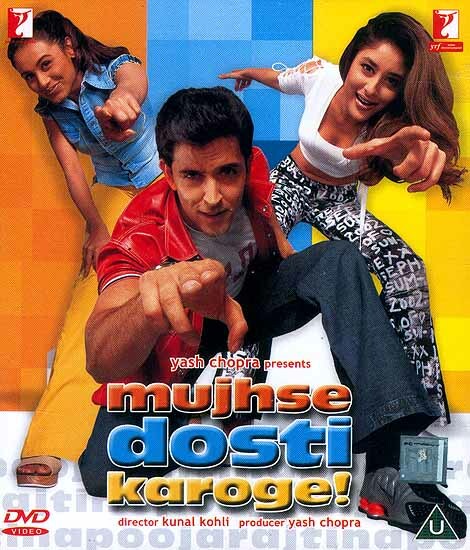 Mujhse Dosti Karoge! A story of 3 friends who truly know the meaning of the word…Dosti!! Optional Subtitles: English / Tamil/Telugu/Kannada/ Malayalam/Gujarati/Bengali.